This article originally appeared on Seeking Alpha on September 22, 2017. Since the post, TG has risen to $19.80 vs. my prediction of a value in the low-to-mid-teens. Tredegar has recovered from lows, but upside is limited. Family owners have returned to management and steadied the ship. Plastic hygiene products are under competitive pressure. Aluminum extrusion is growing but cyclical. An earnings power valuation places the stock price in the low teens. Tredegar (TG) is a Richmond, Va.-based company that operates in two major business segments: plastics used for consumer products and aluminum extrusion deployed in the construction and automotive sectors. The company was badly shaken by Procter & Gamble’s (NYSE:PG) decision to diversify its sources of hygienic plastic films used primarily for sanitary products like diapers. Tredegar forecasts net sales could decline in the plastics business related to personal hygiene for the next several years by $5 million to $10 million annually. The stock plummeted to $14.65 in July from an all-time high of $30 per share in 2013. TG has recently rebounded to $17. Unfortunately, my analysis shows Tredegar to be fairly valued with limited upside. My earnings power valuation yields a stock price below the $15 level. 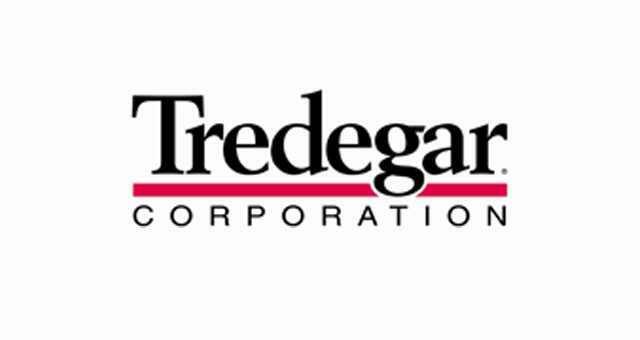 Tredegar has a market capitalization of $560 million and a debt balance of $187 million. Revenues have fallen from $961 million in 2013 to $830 million in 2016. Enthusiasm for TG revived after second quarter results showed revenues stabilizing in the plastics segment and growing in the aluminum extrusion business. Note: The balance sheet for June 2017 has been adjusted by capitalizing R&D investments and operating leases. There is much to like about Tredegar. Family owners Bill and John Gottwald returned to leadership positions in the company after the customer defections during 2015. They have 22% ownership and a clear desire to restore growth. They have recognized the need for urgent transformation. The plastics business is consolidating redundant facilities, and significant dollars have been invested in capital improvements and research and development. The aluminum extrusion business, Bonnell Aluminum, is more promising. The production of specialty products and components for the construction and automotive industry has grown as demand for lightweight materials increases. The recent acquisition of Futura Industries will be accretive to earnings in 2017. Yet, reading of the 2016 CEO letter by John Gottwald leaves one feeling underwhelmed. The CEO admitted his struggle to outline a clear vision for the company. Is this humble candidness or a shell-shocked owner grasping for a future in a family business that was believed to be in transition to a new generation of leadership? Tredegar has posted revenue declines for the past three years ended December 2016. Gross profit peaked in 2012 at $187 million but slumped to $162 million in 2016. 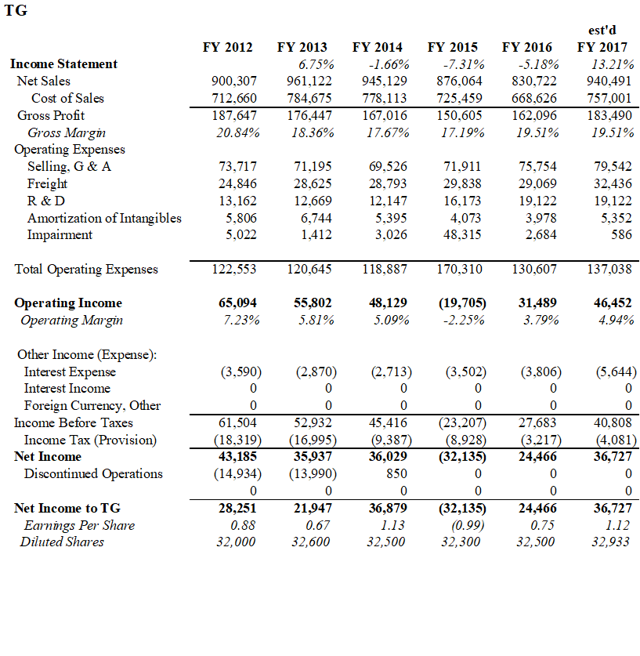 Operating income hit $32 million last year, a decline of over half from 2012. Earnings per share were 75 cents for 2016. At $16.75 per share, the P/E stands at 22. With a dividend of 11 cents, the yield is north of 2.6%. Tredegar had $29.5 million in cash at YE 2016 with $95 million borrowed on a line of credit. The second quarter of 2017 brought better news. Revenues expanded by over $90 million from the prior period in 2016. Operating income expanded by $50 million. Unfortunately, $38 million in revenue growth is attributable to one-off recognition of increased values of ownership stakes in subsidiary businesses. The value of Kaleo, a specialty pharmaceutical company was boosted by about $25 million. Although the re-valuation is welcome, it begs the question of why Tredegar owns part of a pharma company. The results at Kaleo seem to justify the value increase as revenues for the business increased by over $75 million for the first six months of 2017. Another one-time boost came from an $11 million escrow adjustment related to the Terphane acquisition of 2011. The remainder of the revenue increase does hold merit as a sign of growth at Tredegar. The acquisition of Futura Industries, a Utah-based aluminum extrusion company, closed in February. Futura generated revenues of $53 million since February and $6.6 million in operating profit through June 30. Unfortunately, growth didn’t come for free. Debt expanded from $95 million to $187 million during the first half of 2017 due to the $92 million Futura acquisition. Although returns on capital have been in the mid-single digits for several years, TG is committed to research and development that may boost sales in the future. R&D expenditures have been ramped up from $16 million in 2015 to $19 million in 2016. R&D is expected to be the same in 2017. Capital expenditures for plant closings and upgrades are welcome, but they have forced TG into negative free cash flow during recent quarters. The dividend may be at risk. Unfortunately, it is also worth noting that Tredegar has pension liabilities of over $90 million. Evaluating Tredegar is difficult without in-depth knowledge of the thin-film plastic market and aluminum extrusion industries. The author lacks this education and is, therefore, limited to parsing numbers and corporate risk factors. I have assembled an earnings power valuation using the method advocated by Bruce Greenwald. The results are presented below. Think of this article as a “first pass” look at Tredegar. If there is appeal beyond the numbers as presented, then investigate further. Your comments are welcome, and I am happy to revise my analysis if better information is available. Certainly, the world of thin film plastics has potential. Food safety is a big opportunity as people worldwide choose more convenient packaged options. But the business seems highly competitive. The Procter & Gamble loss shows that a search for cost effective suppliers is well under way as brand name profits come under increasing pressure. Investments in technology will help, but can they drive growth or merely prolong a business facing secular headwinds? Aluminum extrusion has much potential, but the reliance on highly cyclical businesses raises significant concerns. It is late in this economic expansion, and headwinds have appeared in vehicle manufacturing. For me, Tredegar shall remain on the sidelines. The stock appears to be fully valued at this time. A sustainable growth trajectory in the plastics business would need to appear before I consider an investment. 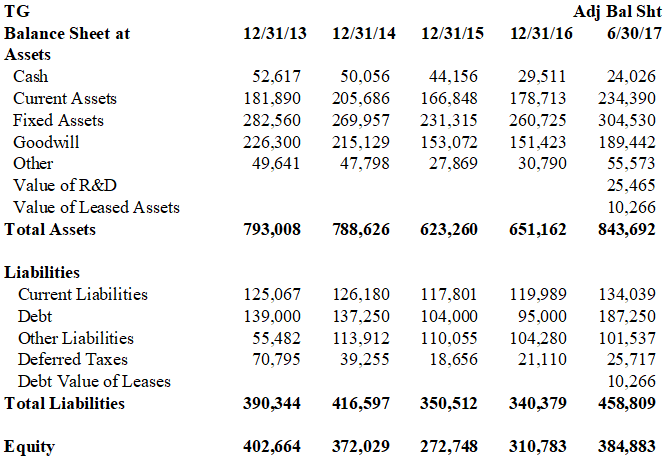 Notes: Revenues – The valuation writeup in Kaleo as well as the Terphane adjustment have been excluded from revenues. 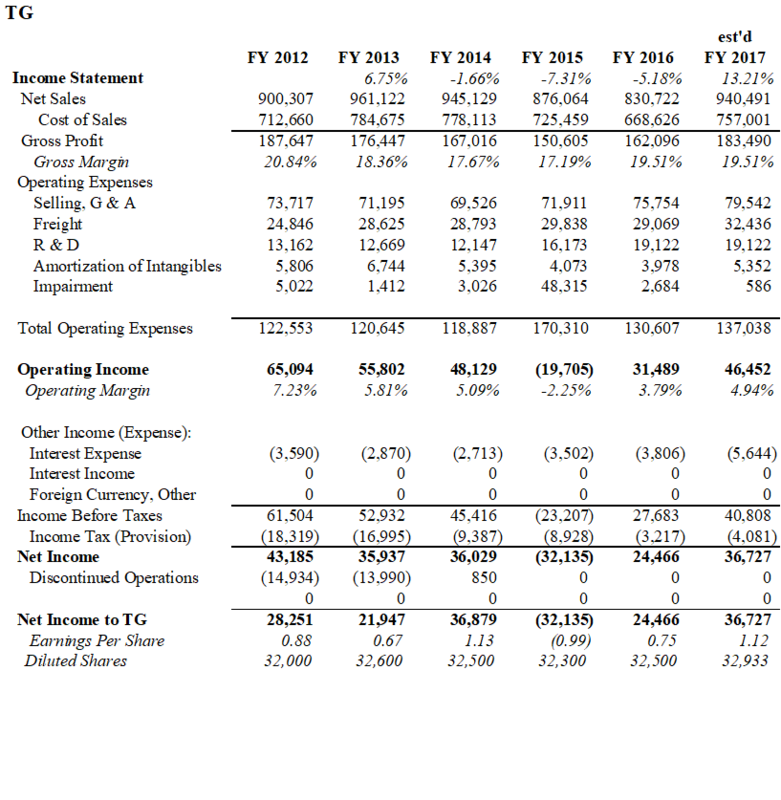 However, the value of Kaleo (cited in the 10-Q) has been added to the net value computation. Beta has been used to calculate the cost of equity. Many would consider the use of beta as distorting the typical Greenwald methodology. However, the author believes a weighted cost of capital at 10.68% is reasonable. Due to one-time tax write-offs, the effective tax rate for 2017 is only 9.9% vs. 29.8% in 2016. For purposes of valuation, a tax rate of 30% is assumed. R&D as an adjusted balance sheet item with expenses reflecting a reimbursement of current expenditures less an allowance for amortization over a four-year period. 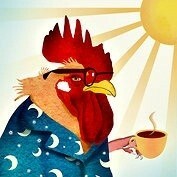 Additional disclosure: As always, the author has presented his own opinions and analysis. You should conduct your own due diligence before investing. I welcome feedback and discussion and I am happy to correct any errors or add any pertinent information to the article.